On this episode of the Real Housewives of Atlanta Reunion the Final portion, drama continues to flourish and wreak havoc upon these women. Now Hunny I was very excited for this two hour long episode. Phaedra finally tells Kenya how it is, how it should’ve been, and how it will be in the future. Phaedra got Kenya together real quick. I personally believe Kenya needed this. Kenya has been provoking Phaedra and Apollo for 2yrs now. 2!!!! Not 1 but 2 years has this nonsense about Kenya texting and being inappropriate with Phaedra’s husband Apollo. Now I am not putting all the blame on Kenya because Apollo knows good and well that he DOES NOT need to be interacting with Kenya AT ALL! Ooooo and let’s not forget the part where Nene told Kenya she is the LOWEST paid sitting on the stage acting a fool. SMH. Child, let me tell you!!! It’s about time that somebody put her in her place. In my honest opinion Kenya needs to be kicked off the show. Honestly shall we start with the obvious? The show is called Real House WIVES of Atlanta. Kenya is single like a dollar bill Hunny. She is just as single as me. She has NO ONE. ABSOLUTELY NO ONE. We’ve witnessed Kenya and Walter and their fake arrangement now Kenya is chasing after Apollo and Phaedra won’t have it!! Kenya is the drama starter and I fear the only reason that she is still here is because she brings drama and drama bring ratings. This show is a reality show but it is very rare to find a show with an all female (African American) cast to actually watch and look up too. Me being a woman of color this is one of the shows I will definitely watch and make sure I see EVERY episode. It is disappointing to see grown black women bickering with one another. We don’t need to be tearing each other down. We should instead be uplifting and encouraging one another. I do look forward to this show airing for another season hopefully Kenya will have changed or will be off the show completely. I’ve voiced my opinion, it’s your turn! Tell me what you think and who you think should stay and go! If you haven’t seen the Porsha Stewart and Kenya Moore fight on the first installment of the Housewives of Atlanta Reunion, you need to get with the times! Now, I am not one for violence but this fight had me on the edge of my seat. The clip of the fight can be found on YouTube and various other websites. So let’s get down to business. Kenya Moore is known from her previous reunion to bring props and get under your skin. This year she decided to bring a “Queens scepter” and bullhorn. 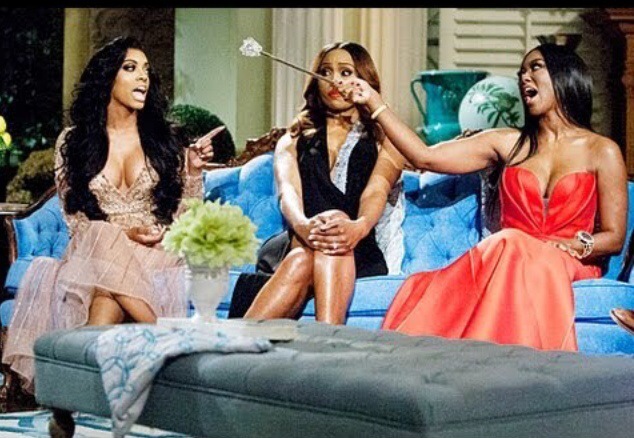 Throughout the reunion she is seen pointing the scepter in Porsha’s face and invading not only Porsha’s space but Cynthia’s personal space. Kenya also decides to over talk Porsha with a bullhorn and not only is she screaming in Porsha’s ear, she is screaming in Cynthia’s ear. We all know what happens next. Porsha snatches the scepter from Kenya then throws it to the ground. A few moments later Porsha is seen standing face to face with Kenya and they are hair pulling! Excuse me, “fighting”!! Haha Of course Kenya being who she is decides to call the cops and report the incident and Porsha is last seen lying on the floor with her fellow cast mates surrounding her; except for Cynthia, she is checking on Kenya. Porsha is soon asked to leave the venue and return at a later date. Many questions and debates arose. #TeamPorsha and #TeamKenya have been trending on Twitter and various other social networks. I personally am on no ones side. I do feel bad for Porsha. Kenya has provoked her throughout the season and now the reunion. Porsha has recently been divorced and just finished a stage play. She is trying to get her business off the ground and the emotional toll that followed her to the reunion spelled disaster. I blame the producers and Andy Cohen. Andy is very familiar with all of the ladies. He even hosts a Watch What Happens Live 30min segment after the show is aired with one of the housewives. So if he knows what provokes them and what makes them tick, why ask them certain questions? Why didn’t he stop the fight when it escalated? What were the producers doing? My guess is they are sitting on the sidelines thinking to themselves RATINGS!!! It is sad that a show meant to uplift and inspire the African American (female) community is now being appraised because of fights and arguments. Now don’t get me wrong I love a good argument here and there. BUT THIS IS TO FAR! I think Porsha should get to keep her job and Kenya needs to tone it all the way down. The producers need to do a much better job. Now my question to you is, what do you think? Music is universal. Don’t you think? Want more? Follow my blog!